On Sunday, I ran in the Oxford half-marathon. Let me start with two quick complaints. First, why do organisers only ever seem to start these faces at 9 or 9.30 in the morning? There were about 4,500 finishers, including runners from London (at least one in the red and yellow Serpentine running vest), Sheffield and all over Southern England. The first London-Oxford train on a Sunday does not even get in till 9:13 in the morning, leaving no time for a race starting 17 minutes later deep in East Oxford. 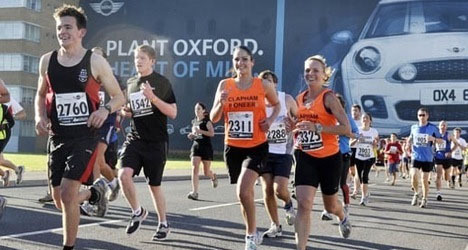 The organisation of the event mandated runners to spend the evening before in Oxford – whereas if they had started it just an hour later, there would not be the same pressure. Second, couldn’t organisers make a little bit more effect to check that the mile markers correspond to the correct distances? At the Richmond half marathon, three weeks ago, the organisers put out mile markers at about half of the milepoints; some were long, some were short, and for anyone relying on the mile markers for their pacing (which included me) they were barely better than useless. Oxford was better in that every mile along our route had a marker of some sort or another, but a number were out by around 300 metres or so, starting with the first two (which were too close to the start) and the third (which was about a mile and a half after the second). I know that these days many runners have GPS watches so it shouldn’t matter if the markers are a bit out, but the watches often don’t connect at all or not at the start, leaving the wearers dependent on the markers they can see. That said, it was a lovely route, with a modest climb of just about 50 feet out of Cowley and towards the Iffley Road near the start, then long periods of descent. In the middle, we ran a lap of the Iffley Road track where Roger Bannister once broke the four minute barrier, we then had a couple of miles running along the Thames. Although I lived in Oxford for four years in my 20s, I had never explored the river south of the Plain, and I reminded myself that this was a stretch of the Thames where my father once spent some of the best days of his life. There were live bands in Iffley, and at Magdalen roundabout, and very large number of local people turned out to cheer us on. Experimenting with running the first half of the race at about 30 seconds per mile faster than I had run Richmond, I tired (of course) in the second half of the race and in the final third was just about “holding on” with miles of 7:30 or so. But the music kept me going, as did the variety of the running. The friend I was running with found a different motivation: a runner next to her told his companion that he was going to be a UKIP council candidate – her fastest mile was the last, which she ran to make sure he could not overtake her. Roger Bannister began the race with a short speech telling us that there were 200,000 people running half marathons that day; a small reminder of the very large numbers of people who run every weekend. It is a social movement, not just a sport. I was SO disappointed by the title of this Dave. I thought it was going to be about how workers could run the half of society now controlled by Oxford graduates.